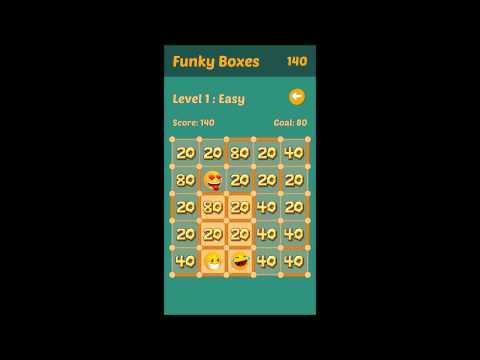 Funky Boxes is a simple and fun puzzle game. Play against computer and prove your worth! Objective is to capture the funky boxes to increase your score and get enough points for the win. But be careful, opponent's boxes will also decrease your score! This brand new puzzle game features multiple levels which get a lot harder as you near the ultimate 10th level. Funky Boxes feature easy and hard opponents out of the box. Beware, it's so much fun you can get easily addicted! Can you beat the ultimate level 10 in hard mode and solve the final puzzle? Can you capture all the funky boxes? Can you win all the bonus levels? Are you simply going to have fun? Click the line between the circles to connect a border. Once all 4 borders of a box are connected, the points will be either added or deducted from your score, depending on who connected the last border of the box. When you connect all borders of a single box, you get to play another move. Collect all three special boxes to reach the bonus level and win additional points! Once all the boxes are taken the level is completed and your score is compared to your goal. If you reach your goal mid-game be careful, the game is not over until all the funky boxes are taken by you or the computer! Each level has a specific goal which has to be achieved. If the easy mode is too easy for you, try yourself in the hard mode and compete against a highly advanced artificial intelligence. Develop your own moves and techniques to achieve mastery of this challenging puzzle game. But the fun doesn't stop at level 10, multi-player mode is in progress so check back soon! Permissions are only needed for ads.